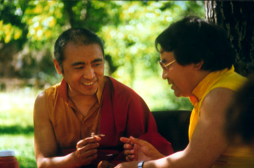 Les Ages, 1987 — the 1987 Rigpa summer retreat in Les Ages in the Dordogne with Sogyal Rinpoche, Nyoshul Khen Rinpoche, Shenphen Dawa Rinpoche, Chagdud Tulku Rinpoche and Pema Wangyal Rinpoche. It was on this occasion that Chagdud Tulku Rinpoche said that all who are connected with Sogyal Rinpoche would be liberated through the blessings of Guru Rinpoche. This page was last edited on 14 June 2010, at 08:05.